Diabetes is a chronic health condition which occurs when the pancreas is not producing enough insulin, which regulates blood sugar, or becomes resistant to and cannot effectively use the insulin it produces. There are three types of diabetes: type 1 (T1DM) which occurs through biological effects where the body naturally produces little or no insulin, type 2 (T2DM) which is largely the result of excess body weight and physical inactivity causing insulin resistance, and gestational diabetes which occurs during pregnancy. T2DM is the overwhelming majority of cases, representing approximately 90% of people with diabetes. Within New Zealand diabetes has increased over time, consistent with worldwide trends. This is reflective of many factors including better detection, slower disease progression, demographic changes, and rising incidence. Currently, more than 250,000 New Zealanders live with diabetes and T2DM in particular is posing serious challenges to the healthcare system. While biological and genetic factors are undoubtedly important risk factors for T2DM individual characteristics are to a large extent shaped by the physical, social, and cultural environments in which one lives. It has been theorised that economies predicated on consumption-based growth have led to an increase in chronic health conditions, such as T2DM, due to an associated over-consumption of energy-dense and low-nutrient foods. Such effects have been exacerbated by a decrease in physical activity due to the sedentary nature of contemporary lifestyles and urban sprawl. The individualisation of risk has, however, taken responsibility away from population drivers of health outcomes which are environmentally and socially determined. Therefore in order to understand the determinants of T2DM individual susceptibility and behaviours, as well as the wider ecological context in which such behaviours are constructed, must be considered. Spatial epidemiology, employed within this study, provides the opportunity to explore such relationships. 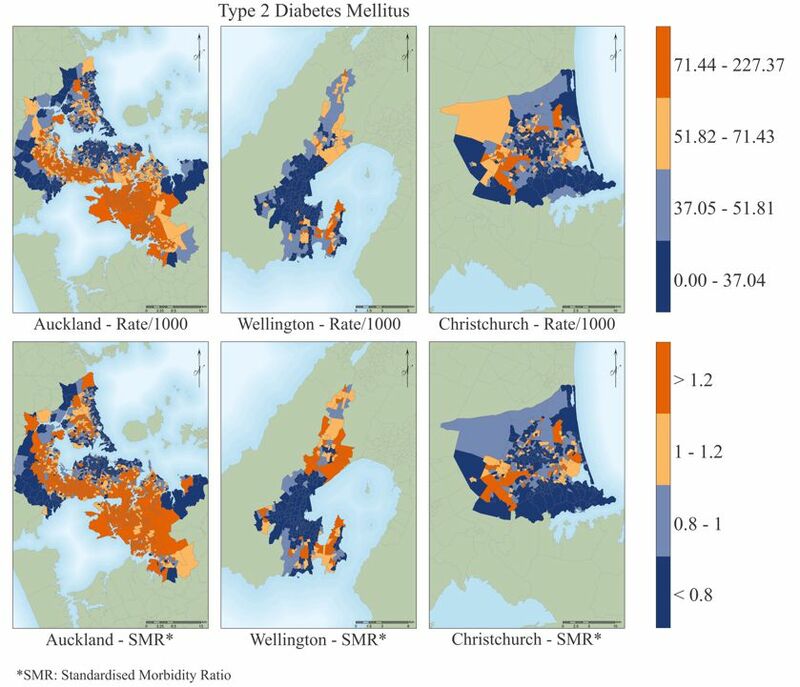 This study focuses on urban areas of New Zealand, using data from the Virtual Diabetes Register (2016) and environmental data on food retail outlets and physical activity spaces. An enhanced two-step floating catchment area model and Bayesian modelling techniques are utilised to investigate potential relationships between T2DM and environmental variables, providing a platform on which to develop strategies and policies to reduce inequalities in T2DM for urban populations.